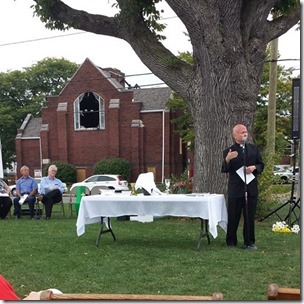 On Sunday, August 31, First Lutheran Church in Lorain, Ohio, worshipped outdoors. The backdrop of this worship setting was their historic, now charred building across the street which, three days earlier, had been destroyed by fire. Just two weeks before, the Northeastern Ohio Synod welcomed its newest pastors at a grand and glorious ordination service inside their sanctuary. Now that sanctuary was in ruins. There were a lot of tears on Sunday. The community was mourning a death. But the sadness was not to have the last word this day. Hope and joy would prevail. First’s talented music director, Brian Wentzel, carefully crafted a liturgy that, through music and litany, word and sacrament, moved the more than 400 people assembled from sorrowful despair, to hopeful rejoicing; beginning with the despondent chanting of, Sometimes I feel like a motherless child, and ending with the Easter hymn, Christ Has Arisen, Alleluia. Pastor Jimmy Madsen led the congregation in a litany that accurately summarized the feelings of many that were there. Raise us up from the ashes and hear us. Raise us up from the ashes and help us. Raise us up from the ashes and save us. Raise us up from the ashes and give us peace. In Christ, life springs forth from the dust and ashes. In Christ, our lives will be raised from the ashes. In Christ, all things will be made new. The liturgy included a healing service that involved the laying on of hands and anointing with oil. Many welcomed and took advantage of the opportunity. It, among several other additional elements, helped to extend the length of the worship to two and half hours! But, as I am fond of saying, no one complains when a football game goes into overtime. This was not a day to be concerned with going elsewhere. It was a day to reflect, remember and rejoice. The television crews respectfully remained on the periphery throughout, unobtrusive in their coverage of what was going on in their view. Pastor Jimmy Madsen preaching at Sunday’s outdoor service. In his sermon, Pastor Jimmy lingered on the history of the building. He didn’t want to move too quickly into the reconstruction. The people needed time to grieve. What touched me in his sermon was the amount of outreach the church does in the community. This is not just a Lutheran church, it is a church for everyone, which is as it should be. The church is about mission, not maintenance. I had put together a graphic pointing out the numerous outreach programs in which the congregation was involved. People were often surprised, mainly, I think, because they weren’t all that involved. They didn’t realize we had been pretty busy. Do not wall yourself off from the surrounding community, but rather, become a part of it – not with the intention of putting more people in your pews, but to make God’s love in Jesus Christ known to everyone. 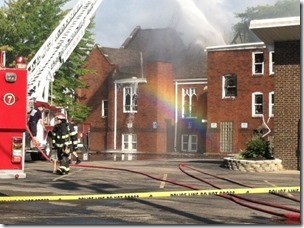 First Lutheran will be rebuilt. But in the meantime, it will continue to do mission and ministry in its surrounding neighborhood. I ask that you hold them in prayer and offer whatever you can as they turn to you in their need. We are, after all, the body of Christ, the church together. Almost official, but already Bishop: Thanks for the update and comments about the fire at First in L. Will be shared with congregation tomorrow. Also read Connie Schultz column. The sisters and brothers at First in L. along with their pastor, Jimmy, will be in our prayers again tomorrow, as will you. See you next Saturday. Pax, Lee Eilert & the folk at Emmanuel in New Philadelphia. Thank you very much, Lee! We plan to have an organized response on behalf of all the synod congregations soon. Look forward to seeing you next Saturday!